Aisha Gaddafi for the first time in four years out of the shadows. Daughter of Muammar Gaddafi, located in Eritrea declared its readiness to continue his father's work and lead the resistance in Libya against NATO and terrorists. The emergence of Aisha in the media appeared on the background of a video published with the last moments of the life of her father. The footage published by the BBC channel for new videos of bloody execution of Muammar Gaddafi of Libya from last forces shouts the word "Shame!". Beaten and bleeding, he barely raised his hand and waits for outcome of his executioners. What shouted before Gaddafi's death executioners tormented (video 18+) >>In the end, one of the torturers head shoots the Colonel. What happened next - it is already known to all. 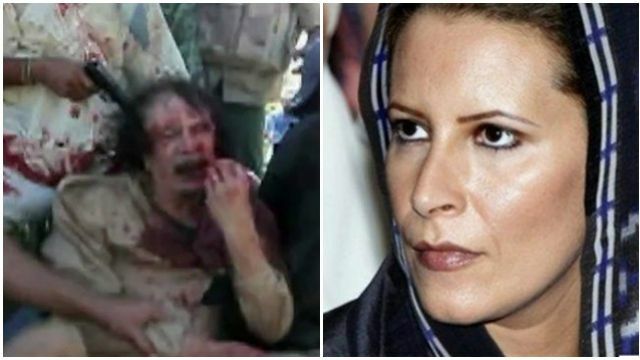 Gaddafi's body was dragged to the barracks, his motorcade was dismantled for souvenirs.Daughter torn Libyan leader urged ordinary people to fight for themselves against the horrors of NATO and the terrorists. In her letter states that the Libyans need to "wake up" to win the victory, to "return to the Jamahiriya government." She also stated that, having lost the entire family during the war, she would take care of his people as his own children. It is noted that the printed version of the message secretly distributed in the two capitals of Libya - Tripoli and Tobruk, and in the near future is expected of her speech on local television.